NovaBirds Cam Blog: First Snowfall 2012! Anyone who was visiting the Birdcam this morning (hopefully) noticed a difference in the landscape! Not only did I do a little Christmas decorating, but over night we received our first dumping of snow! Typically we'll have a few days of light flurries when snow first arrives for the winter...but this year we got a heavy coating over night! What a sight to wake up to! The birds were very active today. 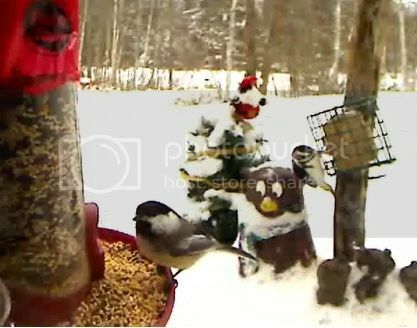 I figure that food is harder to find under the snow, so the feeders were even more appealing! 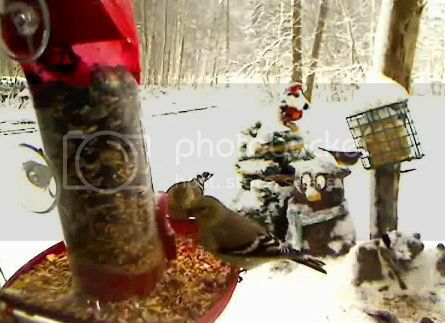 Even the hairy woodpecker came by again for a snack, and I snapped a decent photo of him on the cam (if you look closely, you can see the red patch on the back of his head)! I've seen the woodpecker a few times since then. I think he's going to be a frequent visitor like I had hoped! Make sure you keep checking in frequently! With the snow, there may be even more birds stopping by in search of food and shelter! ...maybe even Scram will stop by again! It's been some time since I've seen that little monster around! 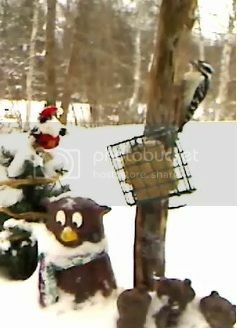 Woodpeckers have arrived on NovaBirds!